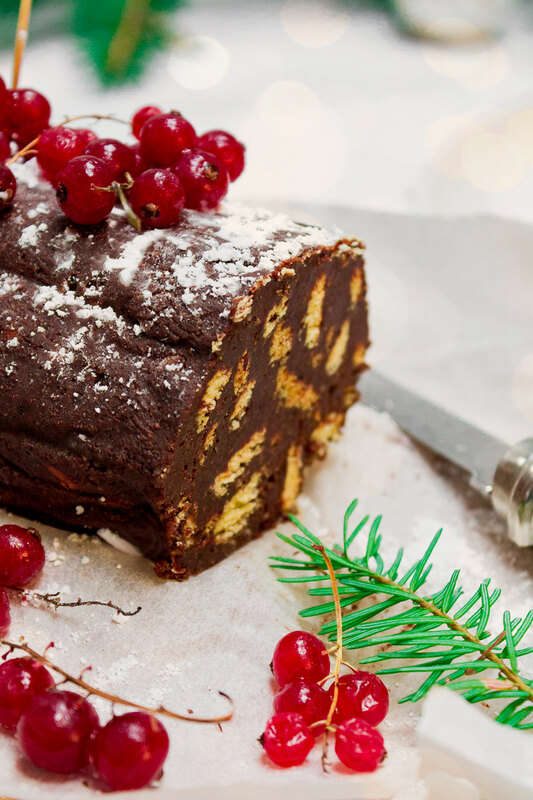 The salame di cioccolato is a typical homemade dessert from northern Italy, where I grew up, particularly appreciated around both Christmas and Easter. 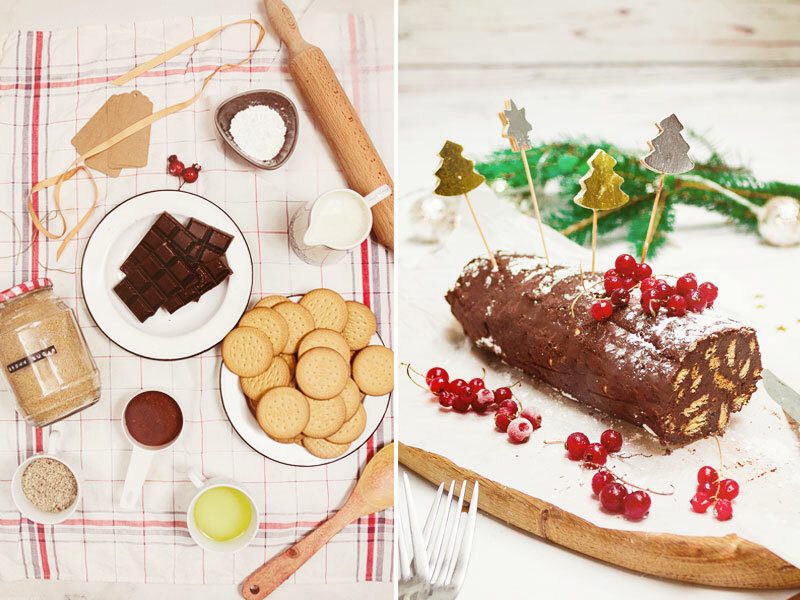 But this easy recipe can be made all year long – it’s quick to assemble with just a few ingredients you certainly already have in your kitchen (cocoa, biscuits, sugar…) and it’s so easy and fun to make you can ask for help to your children. It’s also incredibly easy to bring with you at a friend’s house. So it makes a great DIY gift to offer friends or family during the holiday season. Just pay attention, because as I said it’s pretty addictive and you might think you will only taste one thin slice – but a couple of hours later the whole Vegan Chocolate Salami could have disappeared, I’m warning you! 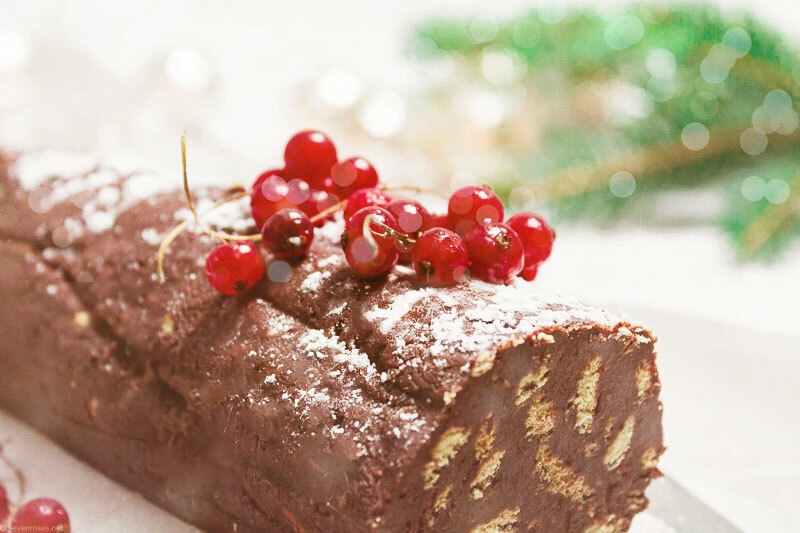 However, if you manage to keep it longer than a couple of hours, this Vegan Chocolate Salami can be kept for a few days (up to 1 week) well wrapped in the fridge. Then you would just take it out when needed, cut a few slices and serve it with coffee, whipped coconut cream, Vegan icecream, or at tea-time on a tray alongside other Vegan cookies. 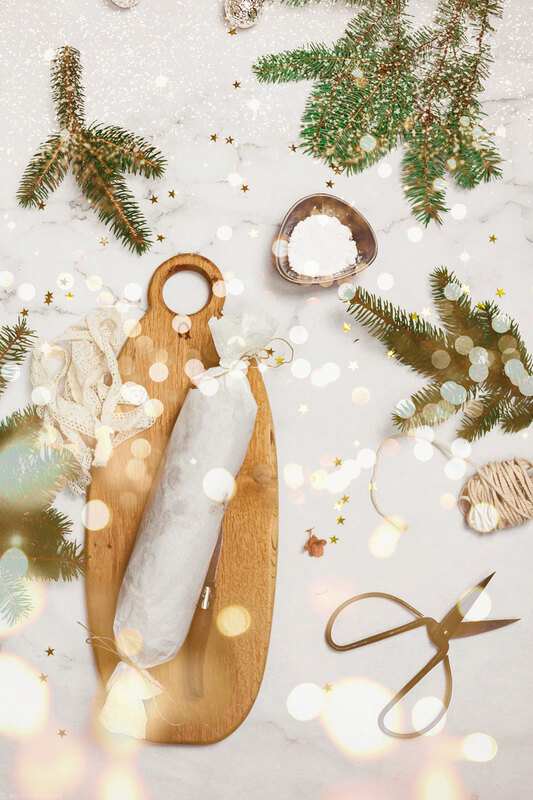 Any Salame al cioccolato can be customized as you prefer, adding hazelnuts, almonds or pistachios, or your favorite liquor, even chilly pepper flakes! My version is inspired by the Piedmont (based on gianduia and hazelnuts). Therefore I added a little bit of hazelnut flour for an even richer experience at every bite. If you are still looking for ideas for gifts to make, take a look at these giftables ideas. But now, let’s get chocolatey! 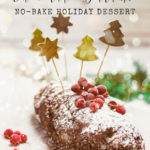 This traditional festive Italian no-bake treat gets a new spin with a delightful Vegan version: so easy and fun to make! 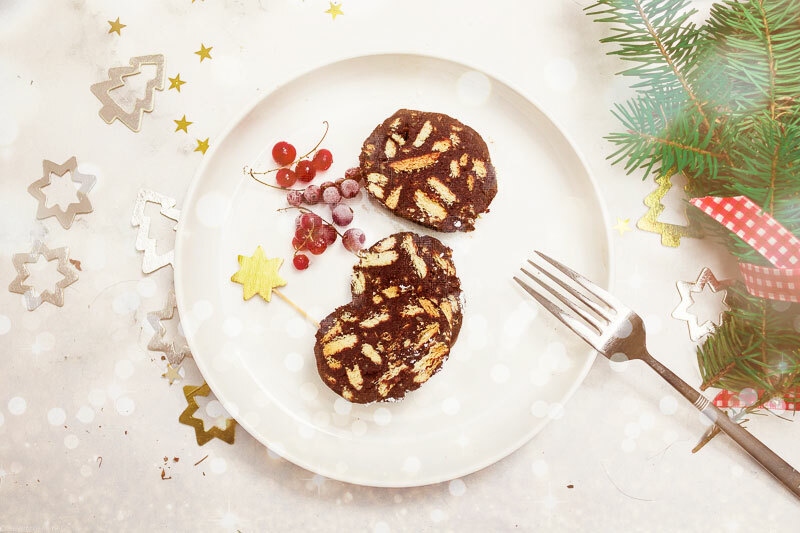 Thanks to a few simple ingredients, the decadent flavor of this Vegan Chocolate Salami will surprise your holiday guests. Melt the dark chocolate in a large bowl over a bain-marie over low heat (or in a microwave in 30" increments). Once melted, remove from the heat and sift the cocoa powder, mixing well to remove any lumps. Meanwhile, combine your plant-based milk, vegetable oil, brown sugar, vanilla extract and liqueur (if using it) into a big bowl. Using a whisk, mix them well. Now fold in the dark chocolate + cocoa powder and stir with a spatula so that everything is well combined. Add the roughly crushed biscuits to the bowl, fold them in gently. You should have a dough that sticks together. Now lay some parchment paper (or plastic wrap) on your table. Pour the mixture in the center and start form a nice compact sausage shape (it can get messy here!). Then roll the parchment paper tightly and give it its final shape with your (clean) hands. 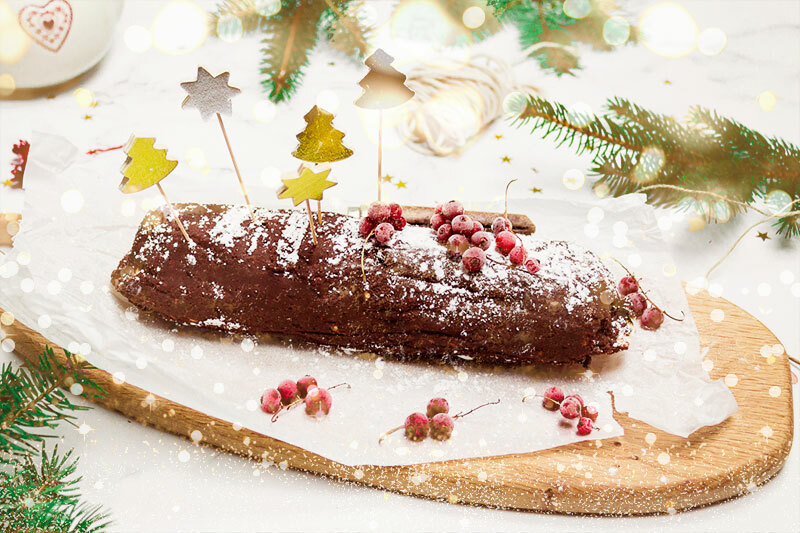 You can roll it again on the table a few times, in order to create a smooth, rounded log. Close the ends like a giant candy by twisting them and place in the refrigerator for at least 2 hours. 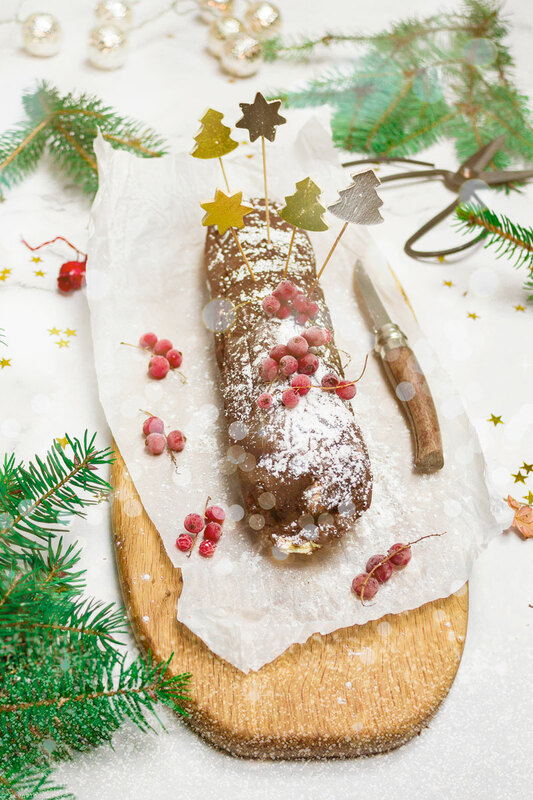 Once the Vegan chocolate salami is firm, remove it from the fridge, carefully unwrap it and sprinkle some icing sugar. Cut into slices and serve fridge cold. Enjoy! 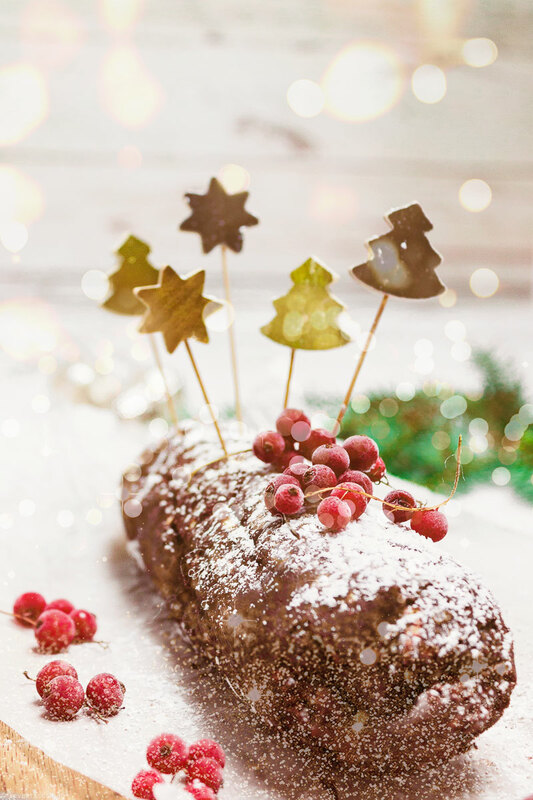 Any Salame al cioccolato can be customized as you prefer, adding hazelnuts, almonds or pistachios, orange zest or your favorite liquor, even chilly pepper flakes! Try all the variations that your immagination can come up with and you'll have a new dessert each time. 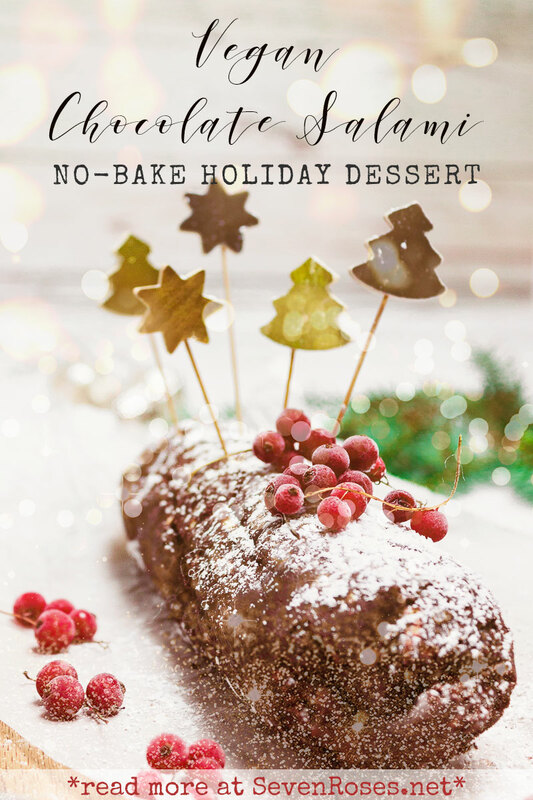 So there you have it, your no-bake holiday dessert is ready! I sure hope you will give it a try and love it as much as I do! 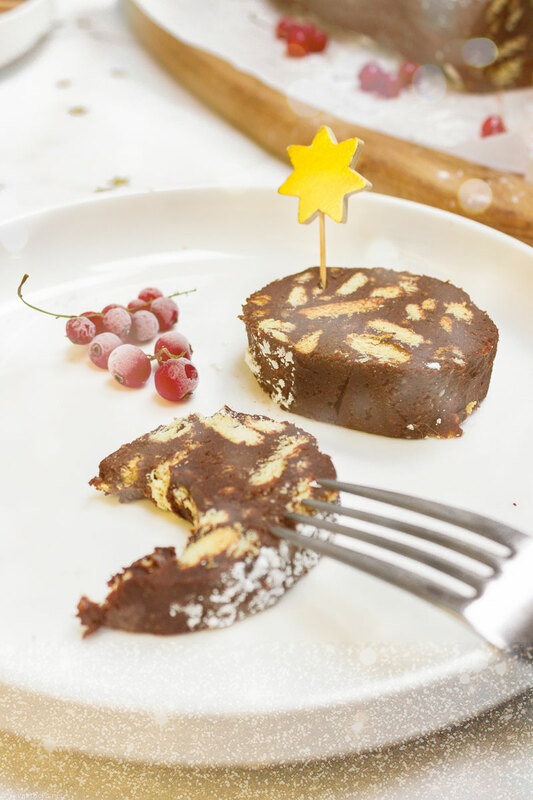 If you give this Vegan Chocolate Salami a try, please let me know in the comments’ section below!